Earlier this month, Apple had a change of heart regarding its Bitcoin policy. The company hinted that it would reconsider allowing Bitcoin apps into the App Store, by changing its App Store Review Guidelines to read: Apps may facilitate transmission of approved virtual currencies provided that they do so in compliance with all state and federal laws for the territories in which the app functions. When Apple first removed Bitcoin apps in February of this year, angry Bitcoin users destroyed their iOS devices by smashing or shooting them, and one user even offered to give away Android devices to those posting videos of iPhones being destroyed. 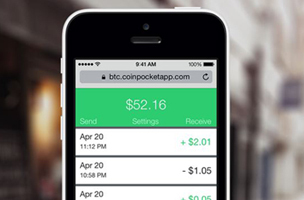 Now, there’s finally an app approved for handling the alternative currency: Coin Pocket. Built by Michael Enriquez, the app already has thousands of users. Coin Pocket also works as a digital wallet on your browser (Safari, Chrome, and Firefox) on desktop and mobile. Some users have not had many success, but the app itself is pretty simple and straightforward. – Sweep Private Keys in HEX, WIF, or BIP38 format. – Export BIP38 private key for backup. – Multiple sources for BTC to USD conversion. Enriquez said Apple spent days reviewing his app – whereas many apps typically took hours. Older Bitcoin apps like Blockchain and Coinbase are still missing from the App Store: “We still haven’t received official word yet, but we’re hopefully optimistic,” says Dan Held, a product director with Blockchain.